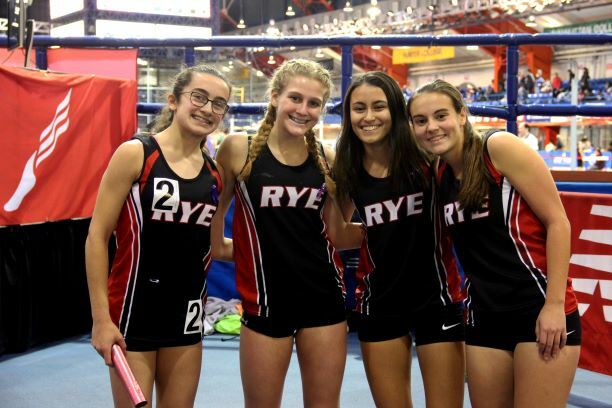 Since Coach Jim Yedowitz’s death on January 2, the Rye High School Track team has competed in five meets, culminating with The County Meet January 27. On January 5, the 4×800 team of Rachael Adelson, Cate McWilliams, Philippa Emms, and Elena Perez-Segnini smashed their own school record and qualified for the New Balance Nationals March 9 at The Armory in Washington Heights. On January 9, Brad Squarek, John Goldszer, Thiago Hammes, and Cian Galligan ran 8:06.76 for third place in the 4×800 relay. Their time qualified them for the New Balance Indoor Nationals and earned them an invitation to compete at the Melrose Games February 9, also at The Armory. In the League meet January 13, both the Boys’ and Girls’ teams placed second overall. Many athletes won their events. Connor Maloney won the high jump, and John Goldzser the 600m. Cian Galligan came in first in both the 3200m and the 1600m, and Bradley Squarek won the 1000m. John Goldzser, Hal Nathan, Ben Johnson, and Connor Maloney broke the 4×400 school record in 3:30.9 to win the League. The 4X 800 relay team of Bradley Squarek, Thiago Hammes, Owen Nguyen, Cian Galligan also placed first. On the Girls’ team, Perez-Signini won the 1000m, Adelson won the 300m and the 600m, while breaking the school record. Pole vaulter Jackie Walker won her event, as did the Girls’ 4X4 and 4X8 squads. In the New Balance Games Invitational January 19, the Girls’ 4×200 team of Sara DeGraw, Lucy Adelson, Katie Coyne, and Cristina Nieves-Molina broke the school record in 1:54.15, as did the Girls’ 4X8 relay team, and freshman Lucy Adelson in the 500m. In the same meet, the Boys’ Distance Medley Relay (Squarek, Maloney, Goldzser, and Galligan) won with the fastest time in New York so far this season, breaking the school record along the way in 10:32.32. All of these meets preceded the Counties, held January 27, where Rye won two gold medals, two silver, and a bronze. They were the Bounty champions in the Boys’ 4X4 and the Girls’ 4X8. Galligan, the senior captain, took home silver in the 1600m race, shaving four seconds off his personal record in the process. He also anchored the second-place finishing 4X8 relay team. Squarek won bronze in the 1000m, as did Rachael Adelson in the 600m while breaking her own school record. 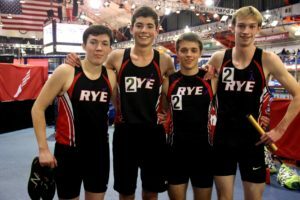 The Rye High Track teams have one more group race, the Section 1 Class B Championships February 6 at The Armory. The Boys 4 X8 will compete at the Melrose Games February 9 and the Boys 4X8 and Girls 4X8 will compete in the New Balance Nationals March 9.